As millennials are projected to surpass baby boomers as the largest generation, they are already dictating the landscape of financial services. Unfortunately, millennials carry the reputation of disliking the practices of big banks. According to a study, 73% of the millennials would instead opt for an offering in financial services from millennial-friendly brands like Google, Amazon, Apple or Paypal than from their nationwide bank. This is why it is crucial for banks to rebrand themselves as “young and connected”. To appeal to millennials and engage with them in the most personalized manner, banks are leaving behind traditional ways of marketing, to adopt a new form of Bluetooth technology – BLE beacons. Beacons + Bank: What does it look like? Here’s how beacon technology at banks/ATMs looks like – A consumer walks into the facility (branch or ATM) with a Bluetooth-enabled smartphone. The moment she enters the proximity (range) of the beacon, she receives a notification from the bank. The notification could be a greeting, a bank offer, or a relevant communication. The range of the beacon is calibrated to notify only the smartphones in the target location. This makes the communication much more relevant, personal and hence helpful. How to leverage beacons in banks? Tech can and should bring ease and simplicity to bank functioning. Beacon technology not only amplifies the branch experience but also helps acquire new customers, which is very critical to banks. According to the Federal Deposit Insurance Corporation, the number of bank branches in the United States has fallen to about 89,860 in 2017 from nearly 100,000 in June 2009. The closings reflect the industry’s need to adopt new ways of customer acquisition quickly. Given that beacons bridge the physical world and digital experiences, with an app, it is a promising solution to customer acquisition for banks. Every marketing campaign with beacons is associated with a QR code which can be downloaded and pasted on posters or flyers that redirect users to the app store directly to download the app. Waiting in ATM queues is torture – especially for millennials. However, exciting offers and interactive experiences can enhance the experience. ATM windows and screens have always been the industries’ go-to place for advertisements and bank offers. Unfortunately, they miss out on impulsive consumers looking to check out offers. Deploying beacons at ATMs allows banks to broadcast their best financial offers and sign up new customers. 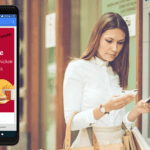 ATM manufacturer Diebold Nixdorf and Australian banking services provider Cuscal are using beacon technology to deliver personalised marketing offers to people as they approach cash machines. ATMs at convenience stores, gas stations, and bus stations also contribute in reaching out to a wider audience interested in financial services. Not just ATM, but several major banks, like DBS, are now installing kiosks that can do a lot more in terms of experience and personalized marketing offers. It’s also interesting to note how banks are employing QR codes to allow millennials to scan QR codes to complete transactions and pave the way for cardless transactions and to prevent fraud perpetrated by card skimmers. In 2012, one in three banks surveyed did not have an active Facebook profile. However, the landscape has transformed in the last few years. Banks are actively using social media to reach out to prospects and existing customers. Retarget prospects who saw your marketing campaign at an ATM, kiosks or convenience store cash machine – online. This is how retargeting with beacons works – A consumer enters an ATM and receives the beacon marketing campaign. She finds the campaign useful, clicks on it but unfortunately does not sign up for the service. She walks out of the ATM. Next when she goes online – Facebook or Google, the bank can recapture her attention with an ad related to the same service. This highly increases the chances of conversion. Similarly, you could also retarget consumers who visited the branch for a new service. Enhancing the experience at financial services branches includes complex beacon applications. To achieve these, you need to integrate the Beaconstac SDK with the bank app. Over 50% of millennials are already using or considering banking applications. What if the consumer walking in does not have the bank app? Use NFC stickers and QR codes on posters, signs or digital signage that points to the app in the respective app store to facilitate easier downloads. Integrate the beacon with your bank CRM and match the online and offline identity of the consumer. You can then pull the identity, relationship history, profile, interests and customer behaviour. Greet customers when they enter the bank premise and give them a glimpse of the services offered. This could be done with an app using beacons or without an app through NFC and QR codes. Waiting in a queue to discover at she is at the wrong desk can be very frustrating. Instead, collect inputs on what services she wants and allocate the desk and a clerk. This not only improves the customer experience but also makes the bank functioning effective. Suggest financial offers based on past investments and interests. You can also advertise your interest rates for a housing loan and car loan based on age. It is important for banks to take feedback on the current experience and how to make it better. You can also run surveys and studies to understand interests and trends to make smart predictions. Banks are eager to amass data, mainly to offer new kinds of loans and investment products. Beacons are extremely helpful is gathering behavioral data. Not just that, with a strong beacon infrastructure in the branch, banks can also fine-tune the resources in the bank and the work timing. Beacon analytics give you a fair sense of which offers resonate with customers and which needs tuning. 1. Are beacons secure to be used in banks? Will it collect information without a user’s consent? In the initial years of beacons, some articles did talk about tracking in beacons and how they can be a threat to security. However, that’s not true – beacons are not designed to collect information from a smartphone. They broadcast a one-way radio signal. When used with an app, they cannot extract any information from a consumer’s smartphone. Besides, the Bluetooth Low Energy standard is designed to transmit tiny packets of information, so it remains as energy efficient as possible. 2. Is there a risk of beacon spoofing and hijacking? To deal with the above, Beaconstac configures each beacon with a unique and complex administrator password. In addition to that the communication between the beacons and mobile apps is fully encrypted by Google. Going forward, we are looking to shuffle beacon identifiers to prevent beacon spoofing and hijacking. Looking to rebrand your bank as “young and connected”? Take a look at Beaconstac, that includes all beacon components needed to make your experience immediately effective.